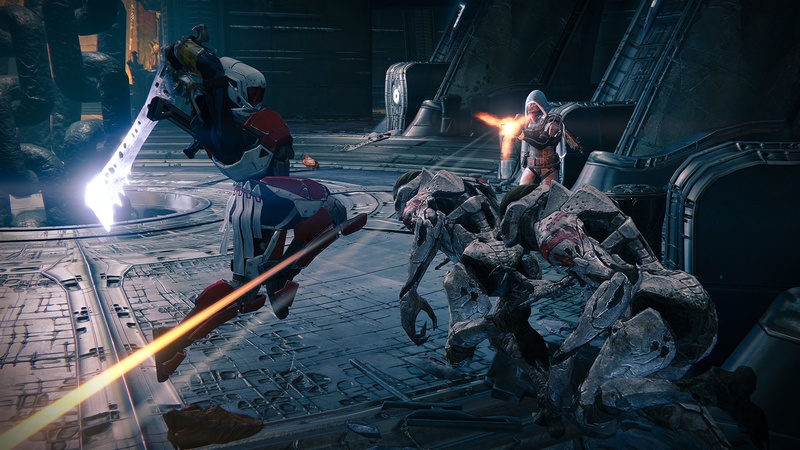 Destiny was one of this year’s biggest releases and, regardless of how you might feel about the final product, it unquestionably stands as one of 2014’s major commercial success stories. It has sold millions of copies, and even a number of months after its initial release, is still home to a huge player base that shows little sign of abating any time soon. The thing is though, as successful as it might have been commercially, there are still major question marks over whether Destiny can be considered a genuine success on a conceptual and/or technical level. Obviously, Destiny must be doing something right on a fundamental level to be able to retain that many players over an extended period of time, but I would argue that, while there are certainly many positive aspects to Destiny, as an MMO, or at least as a game in which you’re are encouraged to spend a lot of your time grinding, Bungie’s behemoth leaves a heck of a lot be desired. While many will undoubtedly disagree, I for one thought that Destiny fell apart the moment it stopped being a traditional shooter. Yes, the co-operative play was all very cool and largely well implemented, but as soon as I finished the “story”, my interest in the game almost immediately fell off a cliff. Perhaps it’s the type of gamer I am, but the grind, the reason to keep playing Destiny beyond the completion of the story, held absolutely no allure for me whatsoever. Don’t get me wrong, while there were new worlds and new missions to explore, I was completely obsessed with the game. I loved the art style, I loved the gunplay and I loved levelling up. I always felt that loot system could have done with some tweaking, but I got right in to that comfortable pattern of finishing a mission, heading back to the Tower, unlocking new items and picking out new missions. It hardly reinvented the wheel, but it was well made, enjoyable and highly addictive. The problem is, as soon as you finish the story and that XP bar disappears, the game becomes a horrible slog. There simply isn’t enough content to carry the experience and that whole ‘light’ thing isn’t explained well at all. I wasn’t sure how I was supposed to level up, and after I found out, realised rather quickly that I couldn’t be bothered anyway. There are only so many times you can play the same missions and shoot the same bad guys before tedium really kicks in. The constant unlocks obviously get their claws in for many, but for me, the severe lack of variety killed the game stone dead. Sure, the story was mince, but until that ended, at least I had something pushing me forward. Sadly, for most gamers, the traditional level cap (XP based) will be hit almost the exact moment that you reach the end of the game, and thus, heralding in the end new content. After that? Well, you can replay levels….over and over again and, uhhhh, well, that’s about it. I appreciate that is a part of all MMO-style games, but come on, no additional content beyond the standard campaign? What’s the deal? Ok, so there are the Raid missions, but honestly, I never even saw those. I’m sure they’re fine, but by time I finished the story, the thought of the grind required to unlock them didn’t appear to be worth the hassle (what with them being set in the same locations as previous missions). As for the competitive multiplayer….well, it’s ok I suppose. Ok, so that’s probably a bit harsh. Like everything else in Destiny, it’s certainly decent, but come on, when was the last time you stuck around for a game with ‘decent’ competitive multiplayer. As with every other aspect of the game, there is obviously a temptation to stick with it for levelling purposes, but in terms of actual enjoyment, Destiny’s multiplayer didn’t live up to Bungie’s previous work with the Halo series and failed to reach the heights attained by the likes of Titanfall and Advance Warfare etc. Destiny does a lot of things well, and I’m sure as it progresses that it will improve greatly (be it via Destiny itself or its inevitable sequel), but as it stands, Bungie’s attempt to combine console FPS mechanics with PC inspired MMO mechanics ultimately misses more than it hits. The core mechanics are fantastic and the content and worlds that are there are all brilliant, but the fact remains that there simply isn’t enough of it. Again, many will disagree, but for me, the hook wasn’t there after I finished the campaign and with its notoriously poor storytelling undermining all of the hard work clearly committed to bringing the universe to life, Destiny ultimately feels like an ‘almost’ experience. Yes, I enjoyed my time with it, but Destiny never quite brings together the two disparate worlds of FPS’ and MMO’s, and for that reason more than any other, was more of a failure than a success in my eyes.